MARTIN REISSMANN. - Die hamburgische Kaufmannschaft des 17. Jahrhunderts in sozialgeschichtlicher Sicht. LINDA GORDON. — Woman's Body, Woman's Right, A Social History of Birth Control in America. | JAMES REED. — From Private Vice to Public Virtue, The Birth Control Movement and American Society since 1830. GEOFFREY CROSSICK, ed. — The Lower Middle Class in Britain 1870-1914. JEAN-LOUIS ROY. 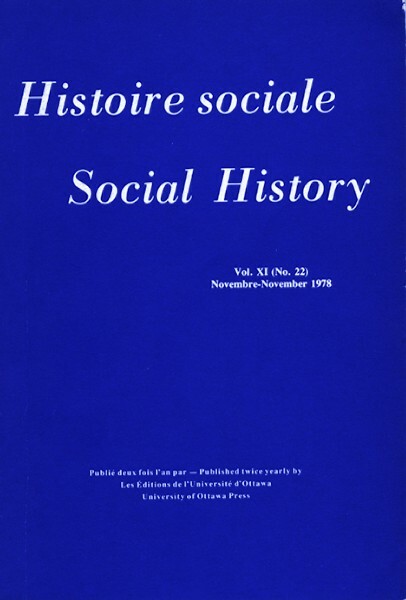 — La Marche des Québécois: le temps des ruptures (1945-1960). DAVID B. KNIGHT. — A Capital for Canada: Conflict and Compromise in the 19th Century. | DAVID B. KNIGHT. — Choosing Canada's Capital: Jealousy and Friction in the 19th Century. ÉLISABETH BOURCIER. — Les journaux privés en Angleterre de 1600 à 1660. GWYN HARRIES-JENKINS. — The Army in Victorian Society. MARTHA VICINUS, ed. — A Widening Sphere: Changing Roles of Victorian Women. Nancy F. Con. — The Bonds of Womanhood. "Woman's Sphere" in New England, 1780-1835. BARBARA M. WILSON, ed. — Ontario and the First World War 1914-1918: A Collection of Documents. GEORGES DUBY. — The Chivalrous Society. Translated by Cynthia Postan. GERALD J.J. TULCHINSKY. — The River Barons: Montreal Businessmen and the Growth of Industry and Transportation, 1837-53. JEAN-PIERRE HARDY et DAVID-THIERY RUDDEL. — Les Apprentis artisans à Québec, 1660-1815. HEATHER GILBERT. — The Life of Lord Mount Stephen. 2 tomes. JOHN HATCHER. — Plague, Population and the English Economy, 1348-1530. MARY ROTH WALSH. "Doctors Wanted: No Women Need Apply". Sexual Barriers in the Medical Profession, 1835-1975. TIMOTHY TACKETT. — Priest and Parish in Eighteenth-Century France. LEWIS H. THOMAS, ed. -William Aberhart and Social Credit in Alberta. PETER CLARK and PAUL SLACK. — English Towns in Transition, 1500-1700.